They are just what every Tuesday needs. Originally, these cookies were supposed to be Friday’s post, but when I sat down to write today’s post, I really just wanted to write about cookies. Granted it’s currently very, very cold, and very, very snowy outside, so talking about a green salad, just didn’t seem right. 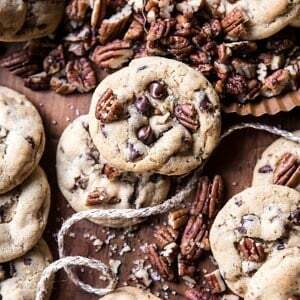 Snow days need cookies, and hey, at least these cookies are healthy…ish! Real talk for a second? Well I’ve loved creating some seriously bright recipes this January for our Healthy January, the one thing I have struggled with is healthier desserts. I always find healthier desserts a little harder than say, just throwing a whole bunch of extra vibrant food in a bowl and calling it a day. Unlike savory foods, desserts usually need a little sugar, and if there’s one thing all health experts agree on, it’s that sugar is pretty bad for us. UGH. But what about our chocolate sweets, you know? I’m not one to give up on a good challenge, so I had to start getting a little creative when it came to healthier sweets. So basically, they’re health food. Cookies for breakfast? And now you’re probably wondering how on Earth these cookies taste even remotely good without any of the usual ingredients cookies contain. Well, I have a secret ingredient. Yup, just dates. Chewy, incredibly sweet dates. I swear, for those of you who think dates aren’t any good, think again because they are a miracle ingredient when it comes to naturally sweetening food, and I love using them in place of processed sugars whenever possible. Major bonus? Even though dates are incredibly sweet, they actually provide nutritional benefits and are high in antioxidants, potassium and magnesium. Just one serving of dates provides about fifteen percent of your daily fiber. Double major bonus? Dates are not only sweet and can replace sugar in recipes, but they’re also super sticky and moist, eliminating the need for binders like butter, oil, and sometimes eggs in vegan baking. You see, you see? Miracle ingredient. I am a little bit obsessed…but moving along now. PS. I sent about a dozen of these cookies over to my parent’s house for them to try. I wasn’t sure how they’d react because my mom is one of those people who thinks she doesn’t like dates…well, she loved these cookies, as did my dad. When you get mom’s approval on a cookie, you know it’s a good cookie. 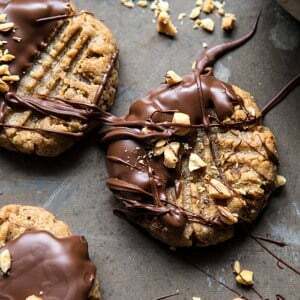 Aside from the dates, these cookies are made up of four other ingredients: peanut butter, vanilla extract, an egg, and a generous amount of dark chocolate. The peanut butter is the key flavor here and I LOVE it…but I’m sure you guys could have guess that. Peanut butter and chocolate are definitely one of my favorite combos. That said, if you’re opposed, or want to switch things up, these work with just about any other nut butter. I’ve made them with almond butter and they are equally delicious and cashew butter sounds like a genius idea. I use organic, salted peanut butter that has no added oil or sugars. Just be sure whatever you are using is salted. If it’s not salted, make sure to add a pinch of salt to the dough. If your dates are feeling dry, soak them in warm water for fifteen minutes or so to plump them up again. Drain the water off before using. As for your chocolate, mine was only seventy-two percent dark. I could have definitely used a darker bar, but I just didn’t have any hand. You can use whatever percent chocolate you’d like. Milk, semi-sweet, or extra, extra dark, it all works. Just depends how healthy…ish you want to be. Most important tip? Do not over bake these cookies…always under bake. Guys, there is no butter, no sugar, and no flour, if you over bake you are going to get a dry, burnt tasting cookie, and that’s not good. So set a timer when you put these in the oven and watch closely. Got it? Good. Now that we have all the details, can we all agree to go home tonight and bake up some healthier peanut butter cookies? I think our Tuesday needs a cookie…dunked in chocolate! No butter, no sugar, and no flour...dates are the secret ingredient here, not only do they replace the sugar, but they make the cookies moist and delicious! 2. 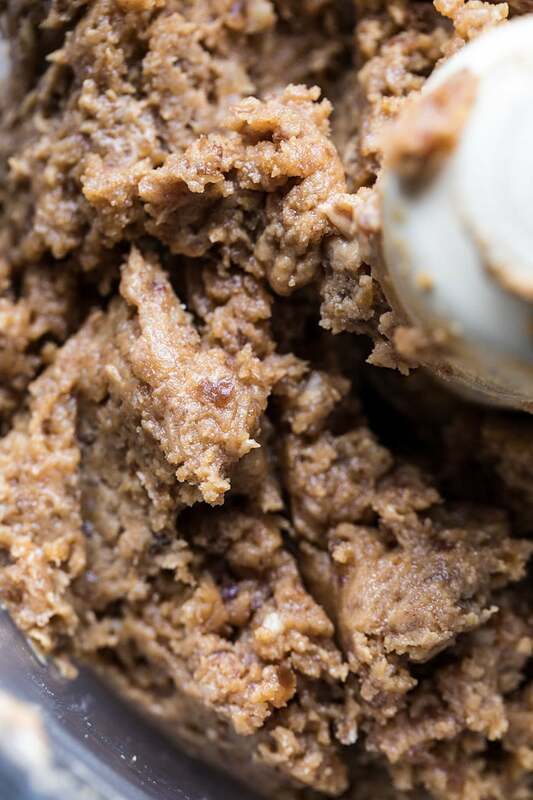 In the bowl of a food processor, combine the peanut butter, dates, and vanilla. Pulse until well combined and no large chunks of dates remain. Add the egg and pulse to combine. Roll the dough 14-15 balls and place on the prepared baking sheet. Using a fork, gently press down on each dough ball to flatten and create a cross hatch pattern. Transfer to the oven and bake for 9-10 minutes. It's important not to over bake these cookies, so set a timer! 3. Remove the cookies from the oven and let cool. To make dipping easier, freeze the cookies for 10-15 minutes. Then drizzle or dip the cookies in chocolate and sprinkle with peanuts. Eat...or let the chocolate harden and store in an airtight container for up to 4 days. Enjoy! YES. IT. DOES. <–all caps are needed. 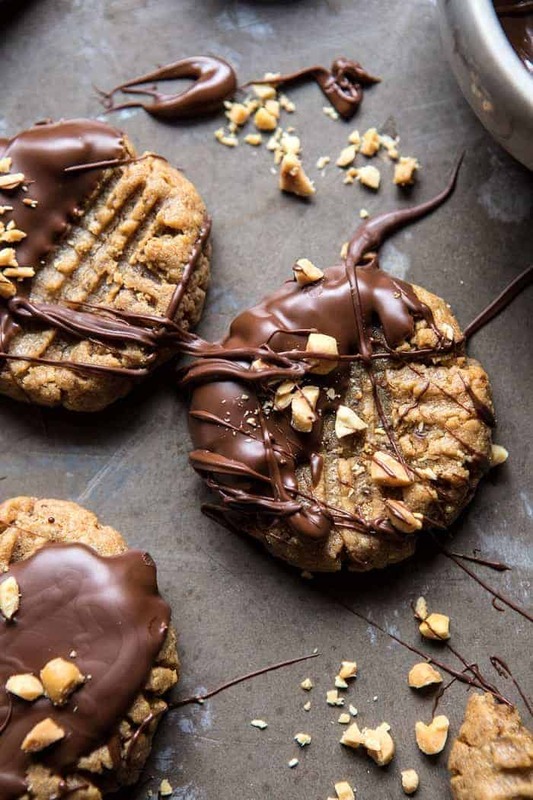 LOVE this balanced indulgence cookie recipe! Gah! I love that you make healthy cookies and then just really want to write about them. These look amazing! YUMMY!!! These look so good as I sit here before breakfast. I could easily eat these now. Ha!! 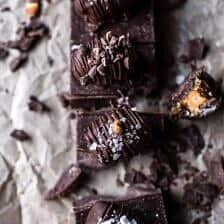 These look delicious, I can’t wait to try them and I have all the ingredients in the pantry ! Thanks for another great recipe. Thank you Linda! I hope you love both of these cookie recipes! These look amazing can’t wait to try. I know what I’m making today! They look delicious! I hope you love these! Thank you Amber! “Absolutely “the best I’ve ever had! I love that! Thank you Laurie, I am so glad you enjoyed these! I love the fact that you switched plans and shared this today on a whim. That’s what cookies are all about in my opinion. 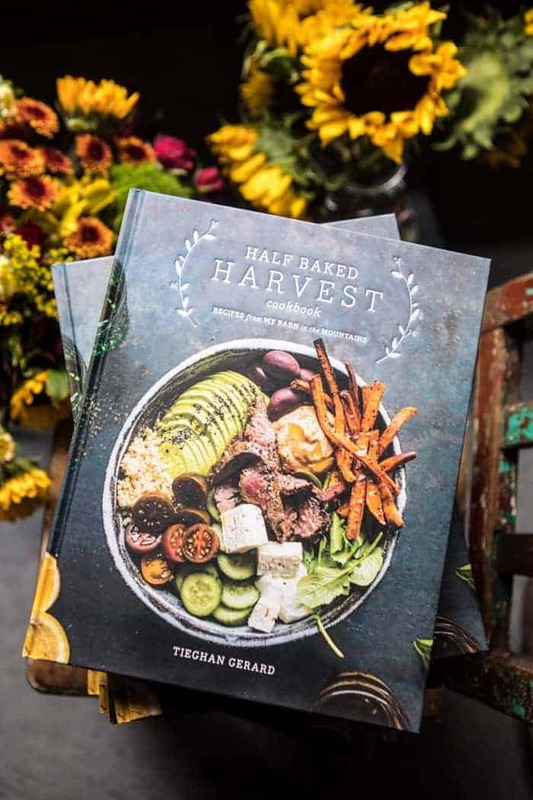 Omg, and Tieghan these look insanely delish! Thank you for sharing them! I know the struggle of making sugar-free desserts – especially since that’s the focus of my blog.
. Hah! All I can say is thank god for dates! Also, I am definitely making these. I hope you love these and they turn out amazing for you! Thanks Caroline! These look delicious, and not bad at only 150/160 calories per cookie. I am going to try them. Thanks for Sharing! keep the healthy recipes coming. Our whole family gained weight over the Holidays, and I am particularly looking for 500 calorie meals. Thanks Tieghan! Thank you Liz! I am so glad you like these! These look great! Would it be possible to freeze them do you think? And if so, do you think it would be better to do in the dough stage or after they’re baked? Thanks! These look totally dangerous! I know what I’ll be making later! These are basically healthy cookies that I can eat whenever I want right? So yummy! Haha of course! So glad you like these Leigh Ann! Thank you! These look amazing! What brand of peanut butter do you recommend? I was wondering this too! I’m very intrigued and want to try these! 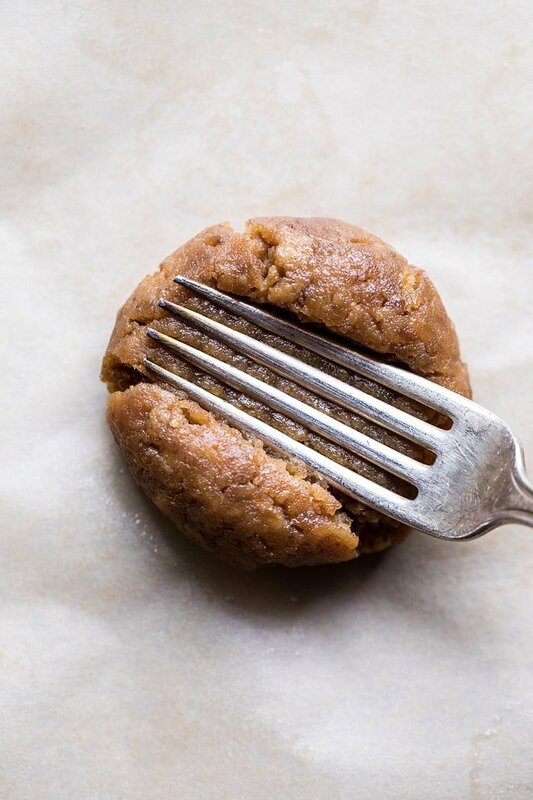 I love these healthy peanut butter cookies! 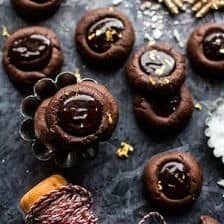 🙂 I agree the dates are wonderful and I like stuffing them with peanut butter or tahini and dipping them in chocolate, but these cookies sound lovely too! How do you dunk them without them falling apart? Haha I had that problem when I made your chocolate gingerbread cookies (I made sure to undertake them, but that made the chocolate dipping difficult). For healthy desserts, I’ve been seeing recipes for poached pears or roasted fruit with Greek yogurt. Maybe something like that would be good? Every single day of the week calls for these! My husband and I decided to cut out refined sugar this month, and these cookies are a life saver! We made them tonight and they are really good! My husband said he can’t tell the difference between these and regular peanut butter cookies. Thanks so much for the recipe!! That is amazing and I hope it is going well! I am really glad you like these Kelsey! Thank you! I have date paste I bought specifically for baking these recipes I always see on food blogs that use it/ dates. 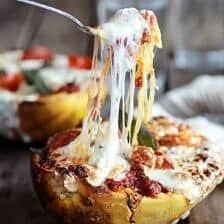 Ideas on how much of the paste I would use in this recipe, would it just be a 1:1? Thank you! I so want to make these! That is so great! Cookies can’t always be healthy, but I thought since its Healthy January AND these taste amazing I would share! I hope you love these! I made winter bliss balls and they are delicious so totally on board with using dates. I have an older food processor so it was tough grinding dates. Someone mentioned using date paste any thoughts on that? Also have you ever used powdered peanut butter?? cant wait to try these pb cookies…easy! Recipe..love it! Thanks! These are absolutely delicious! I did notice that if you try to handle them while hot they crumble, but once cool they are firm and do not crumble. I’m excited to add a new no sugar added recipe to my repertoire! Happy national peanut butter day, and I’m glad to have celebrated with these cookies! I am SO glad you enjoyed these Natasha! Thank you! Yum this looks delicious thanks for sharing! Thanks! I hope you love this! What kind of light do you use when shooting the photos? Only natural light? And do you use a reflector? Also, do you cover the windows with something, like a diffuser? I often think the light from outside ar pretty sharp. I think the light in your photos are so good! Can I ask you what kind of camera lense you use on these pictures? And I would LOVE to see a “behind the scenes” post when you take pictures and than use lightroom to edit them. What lense do you use on this photoes? Hi Ida! This is a link to all my photography equipment! I thought this would be easiest. I like to shoot with both lenses! Thanks! Peanut butter and chocolate! Delicious! With dates – BRILLIANT! Weight watcher point…….whopping 10 freestyle!! These look so delicious. When I first saw the cookie photos I had no idea you used dates in them and then I read it and I was thinking WOW! Genius! I love using dates in dessert recipes but I’ve never used them in cookies. Such a healthy option, I love it. Thank you so much Edwina! I hope you love these! Woo! I hope you love these Caroline! Thank you! I am so looking forward to trying this recipe. My husband has Type 2 diabetes, and I’m still on the lookout to find a good recipe that uses stevia. I didn’t think there would even be an option for something without flour or even butter. 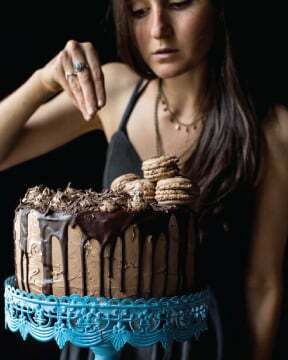 I’m intrigued and will try to make this soon. I hope you love these cookies Jo! Thank you! I made these yesterday after having printed the recipe immediately last week. My date-hating mom was over this morning and didn’t try them because she saw the recipe sitting on the counter and read the ingredients. Later, I asked if she took any cookies (my dad won’t turn down any kind of cookie), and she said I may be missing three cookies – “tried one, then took two!” And now she’s on her way to the store to buy dates. I made these for my seven roommates and these cookies disappeared INSTANTLY. Insanely good and I plan to make again asap. Thank you Tieghan! Thank you Sarah! I am so glad you and your roommates enjoyed these and hope you enjoy some other recipes as well! I just made these on superbowl sunday ! Delcious ! Thank you for another great recipe. I’ll making these again ! I am SO glad you liked this! Thank you Kristine! Ha! 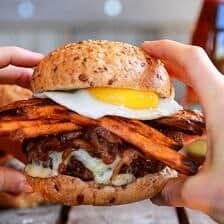 I looked up Healthy-ish recipes and found this. You are a woman after my own heart! I will be making these for my valentine (and my co-workers) thanks for the amazing recipes. 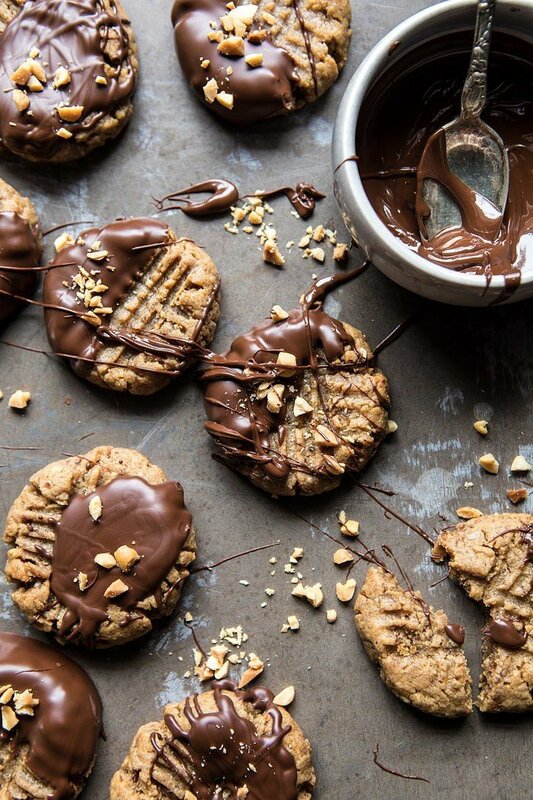 My Sunday afternoon so needs these cookies – love that chocolate dip!! Egg will work? Thank you!! My husband LOVES cookies but decided he needed to cut back on the sugar. I made these for him and he was so delighted. They are a huge hit. Thank you for a easy and simple yet no refined sugar recipe. Can I use a flax egg in place of the egg? Can’t have eggs, has anyone tried this with applesauce as a substitute? Used applesauce instead of the egg, and they turned out great! Delicious and gooey, thank you for this awesome recipe! New fave for sure. I am so happy to hear that! Thank you Missy! Hi! 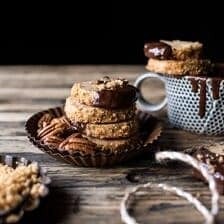 I’m excited to try these cookies and will make them as you published the first time but I was wondering what your thoughts are on replacing the dates with bananas? I love dates & have them on hand but I am always looking for a way to use up my brownish bananas! Do you think the texture would be too gooey? ooooh I love peanut butter and chocolate!! Unfortunately I did not even come to the point where you add the egg – I had to eat the dough before! Delicious just raw with chocolate sprinkled all over it 😀 Delicious ! Haha that is too great! I am really glad you enjoyed this Johanna! Thank you! I made these last night and they were fantastic. Like a larabar/cookie hybrid. I need to bring a dessert to some friends who are vegan. Do you think these could be made with an egg substitute? Any particular one you would recommend? I have no experience with egg substitutes. 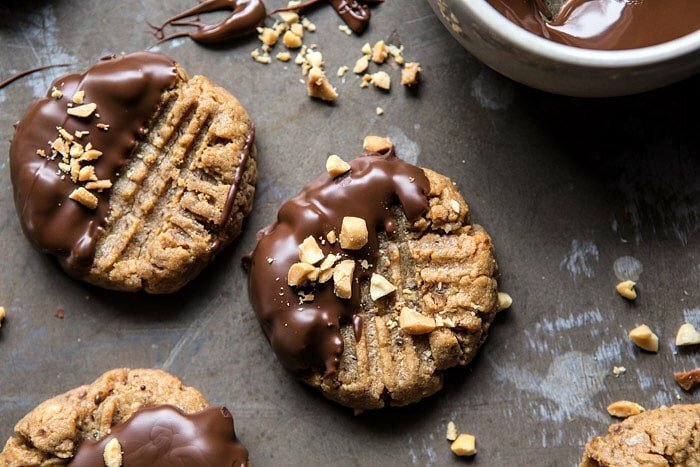 these are in the oven now, I think I over pulsed or used oily PB because mine had to be dropped from a spoon and didn’t want to crosshatch but they taste amazing…suggestions? Amazing! But my dough was super sticky & stuck to my hands when rolling into balls & to my fork when flattening— any tricks to prevent this? Cooling dough in the freezer for a few minutes helped with the rolling but still stuck to the fork! What kind of nut butter and dates did you use? Not sure what the issue was, but using over oily nut butter or not plump dates and effect the consistency. I was shocked to see there was no flour in the recipe. I’m going to try these. I love the combination of peanut butter and chocolate! The perfect treat! I was really craving a cookie and this hit the spot! So so good and easy to make. Perfect!! I am so glad you enjoyed these Maggie! These are incredibly tasty! I made almond butter for these and found them to be extremely sticky and I was unable to crosshatch due to stickiness. Patted them down into disc, once baked I dabbed melted chocolate on the discs. Really awesome tasting! I am so glad you enjoyed these! Thank you Lisa! Saw this recipe today, immediately stopped what I was doing to make them. I have mine in the freezer after dipping in chocolate sauce and they’re so delicious! I love your recipes! Thank you McKenna! I am so happy to hear that! Hi Tieghan! These are delicious! I wanted to make them vegan so I subbed the egg for a flax egg and they still came out so yummy. I will definitely make these again! Thanks for such great recipes!! Thank you Anna! I am so glad you loved these cookies! I’ve made these several times now, and they’re delicious every time! Thank you so much Eva! I am so glad you loved these cookies! great recipe! Just like someone else said, it’s like a peanut butter cookie/Larabar hybrid. Very simple recipe with delicious results. Thank you!! The almond butter cookies were the most delicious nut butter cookies I have ever tasted! Thank you for such a great recipe! Thank you so much Colleen! I am so glad you loved this! These cookies are awesome. I was wondering if there would be an egg substitute that I could use as a binder for my vegan friends. Hi Amaris! I would try a flax egg.. which is 1 tablespoon ground flax seeds with 2 tablespoons of water. Make sure to let it sit, so the ground flax can absorb the water. I hope these turn out amazing for you! These are absolutely the best! My family loved them and my friends with allergies loved them as well. They are so easy to make, great ingredients and taste and guilt free! I tried them with creamy cashew butter and they were so creamy! Thank you so much for this recipe. Thank you Victoria! I am so glad this turned out so well for you! Tieghan, these are such a huge hit that my friends asked why I haven’t brought them to this year’s Friendsgiving! 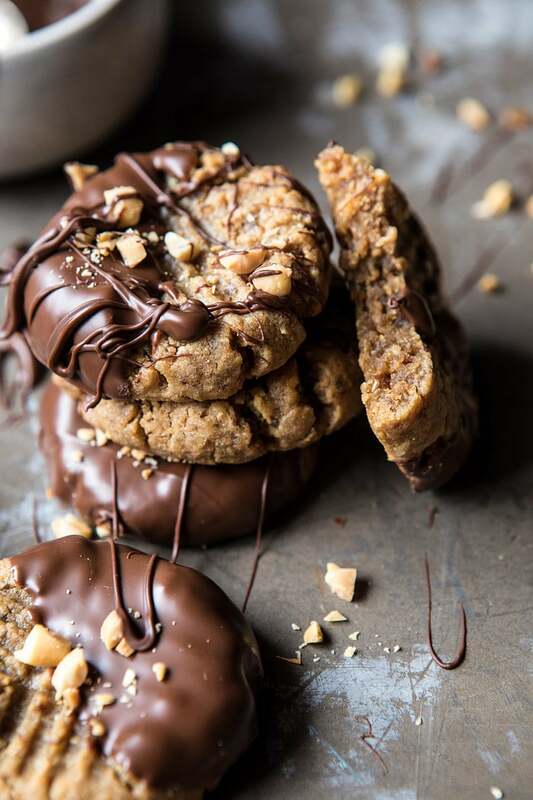 One question: after dipping the cookies in chocolate, do you set them directly back on the parchment paper to cool or do you set them on a cooling rack before drizzling them with chocolate? Thanks! 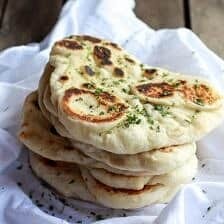 Tieghan, these were such a huge hit at a party that my friends now ask me every time we get together why I didn’t make them! 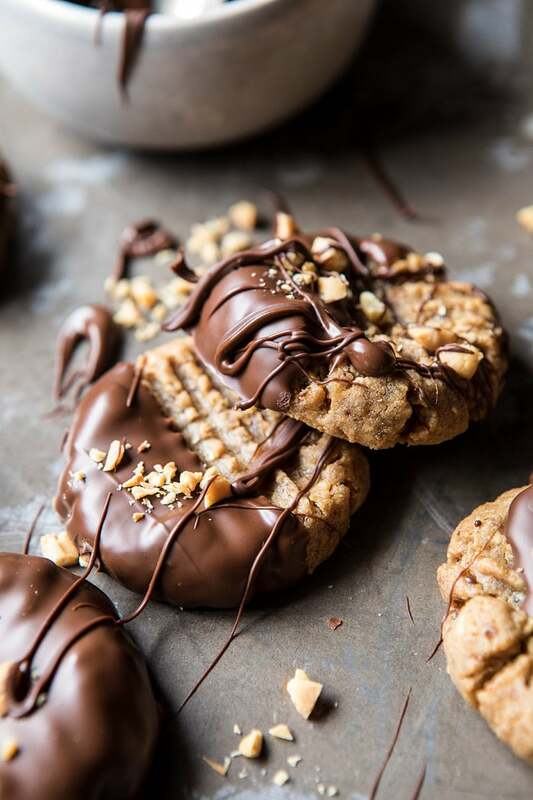 One question: after dipping the cookies in chocolate, do you set them directly back on the parchment paper to cool or do you set them on a cooling rack before drizzling them with chocolate? Thanks! Do you think the cookies would be okay if I made the dough a couple days ahead, kept refreigerated and then baked and dipped? One for me with White..not my choice but have to mind the Doctor. Happiest of everything in the New year. Thank you so much Leslie! I hope you love this! How do you think these would turn out with dried figs instead of dates? HI! I think figs will be a little too dry and the cookies might crumble. I am also not sure of the flavor. That said, I have not tried it so I am really not sure! Let me know if you do give it a try! Are these cookies supposed to be squishy after cooked? I baked them for 9 minutes but they still feel doughy to me! Is this how it is supposed to be? The dough is delicious! Love all your recipes. Love these. My cookies were a bit sticky too so I dipped my fork in powdered PB to make the cross hatch. I am so glad you loved these Patricia! Thank you so much! First time date baker here! These were easy .and delicious. I had a container of Medjool dates bought on a sale whim back in early December. Thank you for the help in making something with them before letting expire out of defeat.. 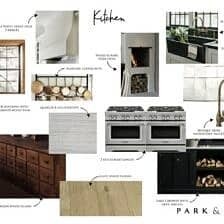 SO simple…yet everything I love in one place…haven’t made…but yummy, yummy. Thanks for a great recipe, will definitely be making on my day off. Could you recommend a substitute for the egg to make these vegan? Also, is this all natural creamy peanut butter? Thank you for the daily food inspiration. I was bummed by these and felt like I wasted perfectly good ingredients. Clearly it’s a winner for some, not for our house. These are amazing! I have never baked with dates before, and it was a pleasant surprise! The cookies are super easy to whip up, and it feels like magic that only three main ingredients can make such a delicious result. I will definitely make these again. Thanks for the crazy good recipe! I love these cookies!! Thank you for existing!! I can’t believe how well the dates compliment the peanut butter. The best part? They won’t make me sick!! Thank you!!!!!!! Can you make ahead and freeze? Thanks.